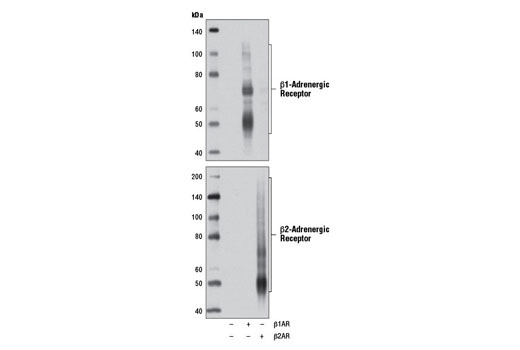 Western blot analysis of extracts from mouse stomach and human heart using β1-Adrenergic Receptor Antibody. Western blot analysis of extracts from 293T cells, mock transfected (-) or transfected with a construct expressing full-length human β1-Adrenergic Receptor (β1AR; +) or full-length human β2-Adrenergic Receptor (β2AR; +), using β1-Adrenergic Receptor Antibody (upper) or β2-Adrenergic Receptor (D6H2) Rabbit mAb #8513 (lower). 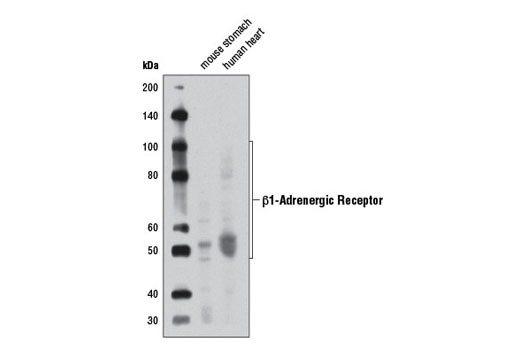 β1-Adrenergic Receptor Antibody recognizes endogenous levels of total human β1-Adrenergic Receptor protein. This antibody does not cross-react with β2-Adrenergic Receptor. Polyclonal antibodies are produced by immunizing animals with a synthetic peptide corresponding to residues surrounding Gly406 of human β1-Adrenergic Receptor protein. Antibodies are purified by protein A and peptide affinity chromatography. β1-Adrenergic Receptor (β1AR) is a G protein-coupled receptor (GPCR) involved in the regulation of cardiovascular functions (1). Together with β2AR, β1AR is a major βAR in the heart. β1AR is activated by catecholamines and couples to Gαs protein, activating adenylate cyclase and increasing intracellular cAMP levels (2). Beta-blockers (βAR antagonists), one of the major class of therapeutics in cardiovascular medicine, act mostly by preventing catecholamine binding to β1AR (3). Brodde, O.E. and Michel, M.C. (1999) Pharmacol Rev 51, 651-90. Rockman, H.A. et al. (2002) Nature 415, 206-12. Frishman, W.H. Am J Ther 15, 565-76.